, a dissenting divine, of the Baptist persuasion, was born in October 1735, at Swaffham, in the county of Norfolk, and was son of Mr. Michael Robinson, a native of North Britain, who possessed a moderate independence. He was sent to a Latin school at SwalFham, at the age of six years, where he made a considerable proficiency, and discovered an uncommon capacity for learning, and afterwards to an endowed grammar-school at Seaming, where he gained some knowledge of the French, as well as of the classical languages. All this, however, ended in his being put apprentice to a hair-dresser, in Crutched-Friars, London. For tjhis occupation his mind was, as may be supposed, already unfitted by the taste for learning which his education had given him, and which he still endeavoured to improve during some part of the hours devoted to sleep. During his apprenticeship he appears to have imbibed serious impressions of religion, which he encouraged, by attending the most celebrated preachers of the day among the independents, the baptists, and the Calvinistic clergy. Dr. Guyse and Gill among the dissenters, Romaine in the church, and Whitfield, the leader of the Calvinistical methodists, were his chief favourites. When about the age of twenty, his indentures were given up, at his own request, as he had a strong desire to become a preacher. His first sermon was delivered to a small congregation at Mildenhal!, in Suffolk, and he afterwards continued to preach among the methodists, at various places, | for about two years, when being unsuccessful in forming a church among them, he left them, and formed a small independent congregation at, Norwich, on leaving which, he also gave up infant baptism. In 1759, he became preacher to a congregation of baptists at Cambridge, and such was his popularity here, that his hearers, dady increasing, were enabled to build a new and commodious meeting, in 1774. Here he was frequently interrupted by the impertinent visits of some under-graduates, against whom he was finally compelled to appeal to the laws of his country, which secured the future tranquillity of the assembly. This seems to be the period of his life most happy and faultless. 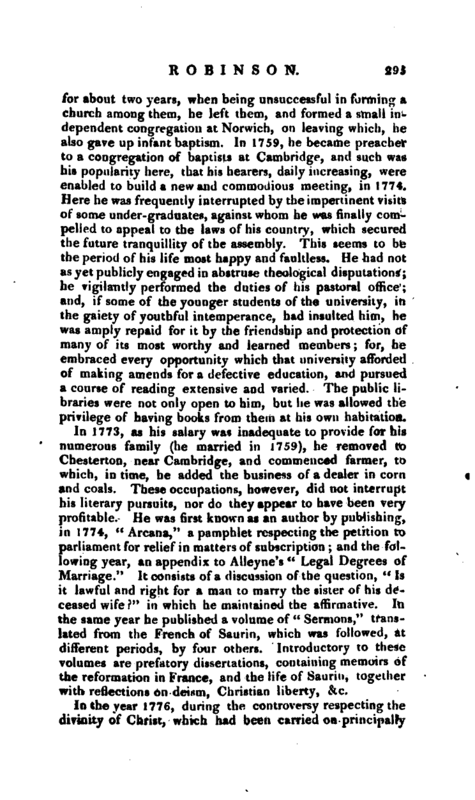 He had not as yet publicly engaged in abstruse theological disputations; he vigilantly performed the duties of his pastoral office; and, if some of the younger students of the university, in the gaiety of youthful intemperance, had insulted him, he was amply repaid for it by the friendship and protection of many of its most worthy and learned members; for, he embraced every opportunity which that university afforded of making amends for a defective education, and pursued a course of reading extensive and varied. The public libraries were not only open to him, but he was allowed the privilege of having books from them at his own habitation. In 1773, as his salary was inadequate to provide for his numerous family (he married in 1759), he removed to Chesterton, near Cambridge, and commenced farmer, to which, in time, he added the business of a dealer in corn and coals. These occupations, however, did not interrupt his literary pursuits, nor do they appear to have been very profitable. He was first known as an author by publishing, in 1774, “Arcana,” a pamphlet respecting the petition “to parliament for relief in matters of subscription; and the following year, an appendix to Alleyne’s” Legal Degrees of Marriage.“It consists of a discussion of the question,” Is it lawful and right for a man to marry the sister of his deceased wife?“in which he maintained the affirmative. In the same year he published a volume of” Sermons," translated from the French of Saurin, which was followed, at different periods, by four others. Introductory to these volumes are prefatory dissertations, containing memoirs of the reformation in France, and the life of Saurin, together with reflections on deism, Christian liberty, &c.
In the year 1776, during the controversy respecting the divinity of Christ, which had been carried on principally | by members of the church of England, Mr. Robinson published “A Plea for the Divinity of our Lord Jesus Christ, &c.” This piece is written with much ingenuity, and it procured the author a number of handsome compliments, not only from dissenting ministers, but also from several dignitaries of the established church. Among the latter were Dr. HinchlirTe, Bishop of Peterborough, Dr. Hallifax, afterwards bishop of Gloucester, Dr. Beadon, afterwards bishop of Bath and Weils, and Dr. Tucker, dean of Gloucester. 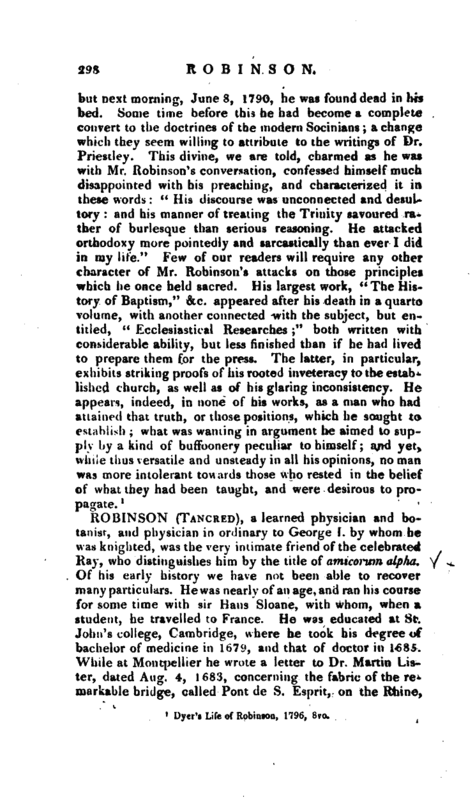 Some years after, Mr. Lindsey published, first without, but afterwards with his name, “An Examination of Mr.Robinson’s Plea for the Divinity of Christ;” to which Mr. Robinson, although frequently called upon, declined to reply. To his friends he said, “The anonymous examiner has not touched my arguments, and his spirit is bitter and contemptuous. His faith stands on criticisms; and my argument is, that if the doctrine requires critical proof, it is not popular, and therefore not divine.” This silence, however, occasioned some suspicion that he was not very sincere, which his conduct afterwards continued. In 1777, Mr. Robinson published a small tract, entitled “The History and Mystery of Good Friday,” in which he employed the same “bitter and contemptuous spirit,” which he had just complained of, in ridiculing the commemoration of the death of our Saviour. 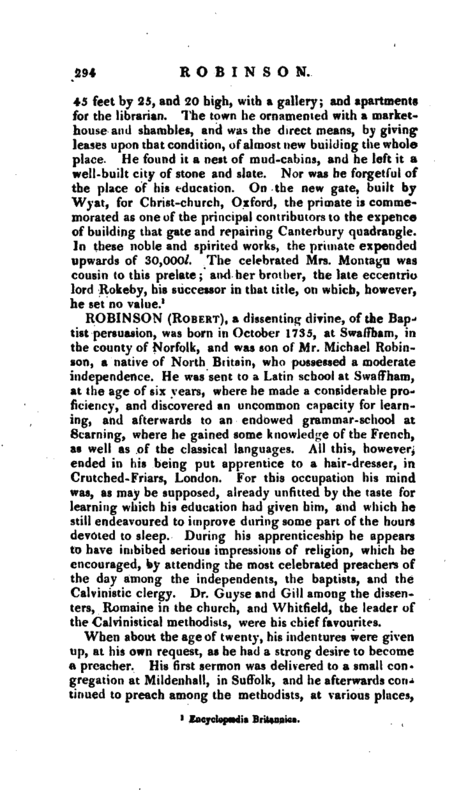 In 1778, Mr. Robinson published *' A Plan of Lectures on the Principles of Nonconformity, for the instruction of Catechumens.“This piece contains an outline of the whole controversy of the dissenters with the church of England, and of their history, from the period of the reformation, to 1778, which of course appeared highly satisfactory to his brethren. Towards the close of the same year, he published” An Essay on the Composition of a Sermon, translated from the original French of the rev. John Claude, with Notes,“in 2 vols. 8vo. The preface to the first volume of the Cl Essay” consists of memoirs of the life of the author. 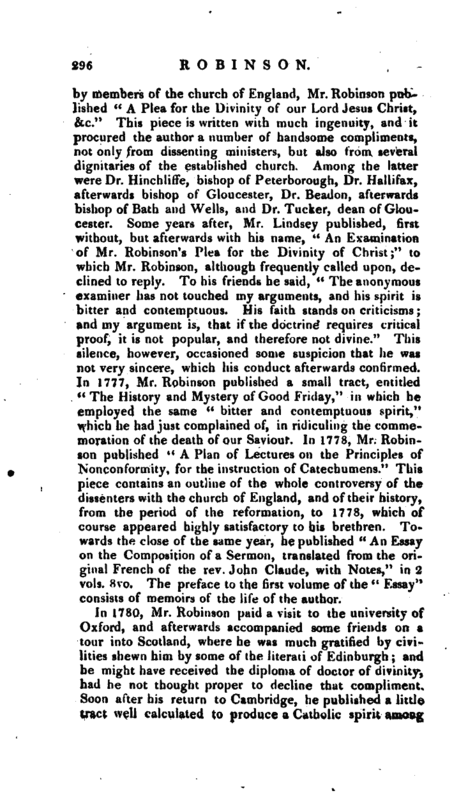 In 1780, Mr. Robinson paid a visit to the university of Oxford, and afterwards accompanied some friends on a tour into Scotland, where he was much gratified by civilities shewn him by some of the literati of Edinburgh; and be might have received the diploma of doctor of divinity, had he not thought proper to decline that compliment. Soon after his return to Cambridge, he published a little tract well calculated to produce a Catholic spirit among | his brethren of the Baptist denomination, entitled “The General Doctrine of Toleration, applied to the particular Case of Free Communion.” It was about this period he preached and published a sermon, entitled “Slavery inconsistent with the Spirit of Christianity,” and he was the author of an excellent petition from the gentry, clergy, freeholders, and other inhabitants in the county of Cambridge, which was presented to the House of Commons. In the year 1781, at the desire of his brethren, he began to collect materials for the History of the English Baptists. In his researches he was led to enter on a larger field than what had been originally proposed to him, and, instead of confining himself to the history of English Baptists, he was induced to trace the history of baptism from the earliest use of that rite, as well as that of Baptists in all ages. 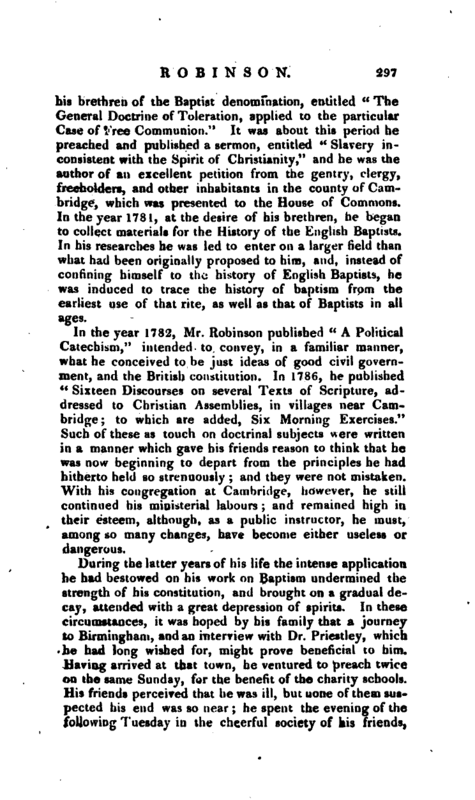 In the year 1782, Mr, Robinson published “A Political Catechism,” intended to convey, in a familiar manner, what he conceived to be just ideas of good civil government, and the British constitution. In 1786, he published “Sixteen Discourses on several Texts of Scripture, addressed to Christian Assemblies, in villages near Cambridge; to which are added, Six Morning Exercises.” Such of these as touch on doctrinal subjects were written in a manner which gave his friends reason to think that he was now beginning to depart from the principles he had hitherto held so strenuously; and they were not mistaken. With his congregation at Cambridge, however, he still continued his ministerial labours; and remained high in their esteem, although, as a public instructor, he must, among so many changes, have become either useless or dangerous. 1 Dyer’s Life of Robinson, 1796, 8vo.